Florida Custom Homes - We Move Walls...Literally! Have you ever fallen in love with a home, thinking the floor plan would be absolutely perfect if only it had a bigger kitchen? Or perhaps you need a private in-law suite, patio paradise or custom three-car garage. Fortunately, changing a floor plan to uniquely suit you is part of our culture. 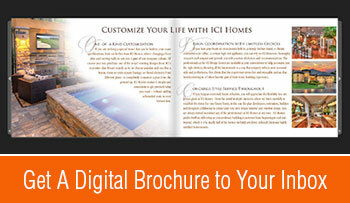 ICI Homes is a one stop custom home builder that both designs and builds each and every custom home we do. And since every customer wants something different, ICI Homes makes it easy to get exactly what you want in a custom built home. We also do it without adding substantial costs to your bottom line! Of course you may select any of our award winning home designs from our library of floor plans exactly as is, or choose add-ons like a bonus room, summer kitchen or extra square footage. You can also blend elements from different home plans or completely customize a home plan to fit your individual needs and lifestyle. Custom home construction can be challenging but our sales consultants and professional in-house home plan developers pride themselves on spending one-on-one time with you to learn about your wants and needs. We then transform your wish list into a final blueprint of YOUR custom home. And we don't just stop when the home is done. We are well known for our superior customer service from start to finish and beyond. ICI Homes has been building luxury custom homes in Florida for nearly 40 years. So whether you're looking to build a custom luxury home in Jacksonville, Tampa, Daytona, Gainesville or any of our area communities in Florida, ICI Homes will deliver the custom built home of your dreams. Want to Build a Custom Home on Your Own Lot in Florida? Schedule a free, no obligation one-on-one consultation with our custom home experts to learn how you can make your dream Florida home a reality!